Chinese New Year, also known as the Spring Festival, is a 15-day celebration starting on the 1st day of the 1st lunar month. Chinese New Year is the most important festival for the Chinese. It is a time for celebration and family reunion. People celebrate by lighting firecrackers and decorating their homes with auspicious signs on their front doors to ward off evil spirits. Twigs and branches are placed in vases and adorned with red envelopes and amulets and charms, usually in red. Red lanterns are hung in the doorways and lucky symbols are pasted on walls for luck. Some of the rituals and customs associated with Chinese New Year is cleaning one’s home before the arrival of the New Year. It is considered bad luck to sweep and wash on the first day of the New Year as you could sweep away the good luck that the first day of the New Year brings. Children and unmarried young people are given red envelopes with money. Everyone wears new clothes as this signifies new beginnings. The festival is a celebration of renewal and arrival of spring. It is customary to visit friends and families during this time bearing gifts of food and red envelopes for unmarried relatives and the children in the family. This is also the time to pay respects to deceased family members. Altars are decorated with lucky symbols and before the family meals are enjoyed, food is offered to family ancestors. 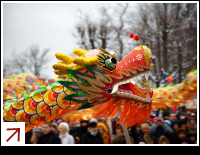 When is Chinese New Year in 2013, 2014, 2015, 2016, 2017?